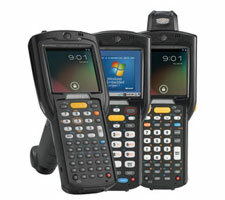 Redefine productivity and reliability with the Zebra MC3200 Mobile Barcode Computer, the next generation in the class-leading MC3000 Series, now with more options to meet your needs. Choose Android Jelly Bean or Windows Embedded Compact 7 coupled with Zebra’s most advanced 1D laser or 1D/2D imager enabling your workers to easily capture barcodes in any condition. Choose from 3 models: brick, gun and turret, bringing all day comfort to every task from cycle counting to put away, replenishment and voice-directed picking. And with over a million and a half MC3000 Series devices sold to date, you get a well-tested device you can trust. 3" Screen, SE4750-SR Std Range 1D/2D Imager, 802.11a/b/g/n, Bluetooth, No Camera, 512MB RAM / 2GB Flash, 28 Key Numeric Keypad, 4800 mAh Battery, Windows Embedded Compact 7.0 OS. 3" Screen, SE4750-SR Std Range 1D/2D Imager, 802.11a/b/g/n, Bluetooth, No Camera, 512MB RAM / 2GB Flash, 38 Key Shifted Alpha Keypad, 4800 mAh Battery, Windows Embedded Compact 7.0 OS. 3" Screen, SE4750-SR Std Range 1D/2D Imager, 802.11a/b/g/n, Bluetooth, No Camera, 512MB RAM / 2GB Flash, 48 Key Alpha-Numeric Keypad, 4800 mAh Battery, Windows Embedded Compact 7.0 OS. 3" Screen, SE4750-SR Std Range 1D/2D Imager, 802.11a/b/g/n, Bluetooth, No Camera, 1GB RAM / 4GB Flash, 48 Key Alpha-Numeric Keypad, 4800 mAh Battery, Windows Embedded Compact 7.0 OS. 3" Screen, SE965 1D Std Range Laser, 802.11a/b/g/n, Bluetooth, No Camera, 512MB RAM / 2GB Flash, 28 Key Numeric Keypad, 4800 mAh Battery, Windows Embedded Compact 7.0 OS. 3" Screen, SE965 1D Std Range Laser, 802.11a/b/g/n, Bluetooth, No Camera, 512MB RAM / 2GB Flash, 38 Key Shifted Alpha Keypad, 4800 mAh Battery, Windows Embedded Compact 7.0 OS. 3" Screen, SE965 1D Std Range Laser, 802.11a/b/g/n, Bluetooth, No Camera, 512MB RAM / 2GB Flash, 48 Key Alpha-Numeric Keypad, 4800 mAh Battery, Windows Embedded Compact 7.0 OS. 3" Screen, SE965 1D Std Range Laser, 802.11a/b/g/n, Bluetooth, No Camera, 1GB RAM / 4GB Flash, 48 Key Alpha-Numeric Keypad, 4800 mAh Battery, Windows Embedded Compact 7.0 OS. 3" Screen, SE965 1D Std Range Laser, 802.11a/b/g/n, Bluetooth, No Camera, 1GB RAM / 4GB Flash, 38 Key Shifted Alpha Keypad, 4800 mAh Battery, Windows Embedded Compact 7.0 OS. 3" Screen, SE965 1D Std Range Laser, 802.11a/b/g/n, Bluetooth, No Camera, 1GB RAM / 4GB Flash, 28 Key Numeric Keypad, 4800 mAh Battery, Windows Embedded Compact 7.0 OS. 3" Screen, SE4750-MR Mid Range 1D/2D Imager, 802.11a/b/g/n, Bluetooth, No Camera, 1GB RAM / 4GB Flash, 48 Key Alpha-Numeric Keypad, 4800 mAh Battery, Windows Embedded Compact 7.0 OS. 3" Screen, SE4750-MR Mid Range 1D/2D Imager, 802.11a/b/g/n, Bluetooth, No Camera, 512MB RAM / 2GB Flash, 48 Key Alpha-Numeric Keypad, 4800 mAh Battery, Windows Embedded Compact 7.0 OS. 3" Screen, SE965 1D Std Range Laser, 802.11a/b/g/n, Bluetooth, No Camera, 512MB RAM / 2GB Flash, 28 Key Numeric Keypad, 2740 mAh Battery, Windows Embedded Compact 7.0 OS. 3" Screen, SE965 1D Std Range Laser, 802.11a/b/g/n, Bluetooth, No Camera, 512MB RAM / 2GB Flash, 38 Key Shifted Alpha Keypad, 2740 mAh Battery, Windows Embedded Compact 7.0 OS. 3" Screen, SE965 1D Std Range Laser, 802.11a/b/g/n, Bluetooth, No Camera, 512MB RAM / 2GB Flash, 48 Key Alpha-Numeric Keypad, 2740 mAh Battery, Windows Embedded Compact 7.0 OS. 3" Screen, SE4750-SR Std Range 1D/2D Imager, 802.11a/b/g/n, Bluetooth, No Camera, 512MB RAM / 2GB Flash, 28 Key Numeric Keypad, 2740 mAh Battery, Windows Embedded Compact 7.0 OS. 3" Screen, SE4750-SR Std Range 1D/2D Imager, 802.11a/b/g/n, Bluetooth, No Camera, 512MB RAM / 2GB Flash, 48 Key Alpha-Numeric Keypad, 2740 mAh Battery, Windows Embedded Compact 7.0 OS. 3" Screen, SE4750-SR Std Range 1D/2D Imager, 802.11a/b/g/n, Bluetooth, No Camera, 1GB RAM / 4GB Flash, 38 Key Shifted Alpha Keypad, 2740 mAh Battery, Windows Embedded Compact 7.0 OS. 3" Screen, SE4750-SR Std Range 1D/2D Imager, 802.11a/b/g/n, Bluetooth, No Camera, 1GB RAM / 4GB Flash, 28 Key Numeric Keypad, 4800 mAh Battery, Windows Embedded Compact 7.0 OS. 3" Screen, SE4750-SR Std Range 1D/2D Imager, 802.11a/b/g/n, Bluetooth, No Camera, 1GB RAM / 4GB Flash, 38 Key Shifted Alpha Keypad, 4800 mAh Battery, Windows Embedded Compact 7.0 OS.